The sound of Malombo, which has deep roots in Dr Philip Tabane’s Venda culture, has throngs of devotees spanning several generations. Now, a quiet yet concerted resurgence is being spearheaded by the folks at the Pan African Space Station (Pass), a month-long cultural takeover of Cape Town that includes a five-day live music festival. Tabane, the founder of Malombo –backed on drums by his son Thabang, percussionist Given Mphago and bassist Zakes Ntuli — is due to appear at two separate venues on September 30 and October 2. “Pass is about giving a platform to artists from Africa who are breaking out of the cliché, the predictable, and who are charting new ground –whether it be from a traditional or futuristic point of view –in how they make and perform music,” says co-curator Neo Muyanga. Pass is affiliated to Chimurenga, a cultural magazine started about eight years ago. In the most recent print edition, free jazz is explored through an illuminating interview by Johnny Dyani with Aryan Kaganof and a series of enigmatic portraits. Poring over the pages of Chimurenga 15: The Curriculum Is Everything is like entering the realm of the metaphysical, with Tabane’s presence hovering above almost every story dealing with music. The title, for one, could be read as an ode to his disregard for “essential information”, as far as formal education is concerned. But as you flip through the pages, Dyani mirrors the doctor’s lifelong struggle to topple the tag of “malombo jazz” and chart a singular course for Malombo the group; Geoff Mphakathi, Lefifi Tladi and others trace the sociopolitical backdrop that necessitated Tabane’s resistance; and Salim Washington and Sazi Dlamini discuss “indigenous, alternative possibilities” and music as a door to life, echoing Malombo’s guiding principles. There are passing references to filmmakers Dumisani Phakathi and Khalo Matabane, whose documentary, Bajove Dokotela, is an endearing portrait of the Tabane seen through the prism of his neighbourhood, Mamelodi West. On the other side of the corporate fence, music label Gallo recently released the momentous Live at the Market Theatre set, which features Tabane in top form, seamlessly hopping from malombo drums to twin pennywhistles, all the while holding court on his iconic Gibson Super 400. Recorded six years ago, the 16-track DVD, which has also been released as a double CD, showcases a peaking Tabane in all his mischievous sorcery. But what is also on show is the intuitive spring of Thabang Tabane, the heir to the malombo dynasty, hardly missing a beat in anchoring his father’s unpredictable, stop-start orchestration. 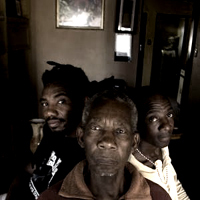 In Bajove Dokotela Tabane’s relationship with his son, Thabang, is portrayed in a celestial light. Seated among them on a scorching Friday afternoon, it’s easy to see why. Their connection extends beyond parenthood, encapsulating the past, present and future of the music style they guard as a family treasure. Perched on a sofa in his humble lounge, the ageing patriarch still contributes to his own myth-making. Flipping between poetic Sepedi and savvy English, he maintains that he never went beyond Sub B (now grade 2) at school; professes his love for guns (“their sound reminds me of malombo drums”) and swears he listens only to Miles Davis because the trumpeter was “no pretender”. In a circumspect yet jocular mood, Tabane is quite content to let Thabang and Mphago, Malombo’s new guard, expand on the genre’s humanistic agenda. If one takes Sello Galane’s thorough doctoral thesis on the music of Philip Tabane as the Bible on the subject, we are in around phase 13 of the malombo project, with the young guns ready to bridge the generation gap and take the sound in new, unpredictable directions. “Our technique playing [percussion] is experimental and freer,” says the dreadlocked Mphago, who has slowly been eased into the Malombo line-up after years of apprenticeship with former schoolmate Thabang. With Thabang and current bass player Ntuli, they form the band Malopo, carving a drier, earthier version of Tabane’s form. allows me to grow,” he says. “Thandiswa’s music is spiritual, so it’s easy to gel with it. She purposefully sought me out because she feels the spirituality of my playing. Other people who played with my father usually just played with him alone. Although albums like the uneven Muvhango prove that no amount of electronic fiddling can propel malombo further into the stratosphere (check the head-swirling Pele Pele for proof), we wait with a fair amount of trepidation to see whether “new vibe” and “spice” will translate into renewed vigour for Dr Philip Tabane’s legacy. The Pan African Space Station (Pass) is a month-long, livestreaming web radio, which kicked off on Biko Day (September 12). Pass Live is a five-day, five-venue complementary session running from September 28 to October 2. It would be that simple, except that the lines blur as Cape Town becomes a hub of future-forward, diasporic discourse, often off the stage and into the waves and vice versa. Pass co-curator, Neo Muyanga, breaks down the calculated science of the space programme. How did Pass come about? It came out of many late-night conversations [co-curator] Ntone [Edjabe] and I have had about music and how it is consumed and packaged. We’ve also talked a great deal about how Africans can use the tools of the 21st century to write and broadcast our own manifestos. We’ve always wanted Pass on the streets, on radio and not exclusively on the net. Sadly, we never heard from the Independent Communications Authority of South Africa after we submitted a thick application form for an FM licence. We then decided to find another way to do it. This is how we came to commission artist Douglas Gimberg and architect Greer Valley to make our musical rocket ship, “Bianca the Othaship”, which plays Pass sounds at St George’s Mall in Cape Town. We’ve developed a warm relationship with the people at the Mandela Rhodes Foundation and they’ve allowed us to use their piece of the Berlin Wall as a launch pad for our terrestrial space ship. Collaboration is a big part of the Pass ethos. What is the magical aspect of hooking up artists from different spheres? The trick is to ask the artists themselves if there are collaborations they’ve been wishing to explore but have never had the means to actualise. With the backing of the Africa Centre, we’ve been able to help manifest artists’ most outlandish imagination. In 2008, when Madala Kunene told us he wanted to put on a show that would reveal to the audience what it’s like to be blind, we blacked out the whole of the Slave Church Museum so that he could play a 90-minute set in pitch darkness. It was an incredible moment. How do the venues complement the aesthetics of the festival? We choose to put on performances at venues that hold iconic stature in the city (and the country’s) imagination. This is because we want the performances to be affected and informed, to some extent, by the heritage and sociopolitics around us. For instance, we use the Slave Church Museum as well as St George’s Cathedral, because these venues fall within the same narrative of slavery and imperialism that built this economy. Category: News, Pass Blog | Bookmark: permalink.